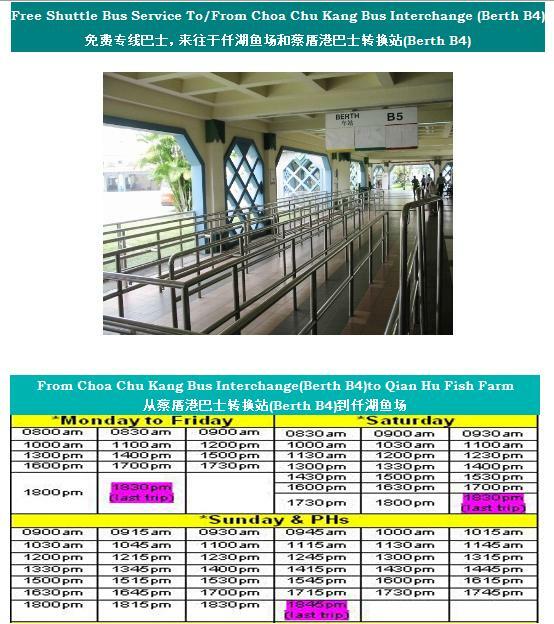 To get to Qian Hu Fish Farm, you can take their free shuttle service from Chua Chu Kang Bus Interchange. Extracted some details from Qian Hu Fish Farm site – check their site for updated timetable. Doctor Fish is the name given to two species of fish: Garra rufa and Cyprinion macrostomus. They feed on the dead and unhealthy skin cells on the human body, leaving the skin feeling smoother and softer. As the fishes have no teeth, the process is not painful and can be quite a pleasant sensation after the initial ticklish feeling has subsided and you have relaxed into the treatment. Doctor Fish have proven to be quite effective at treating flaky and dried skin, leaving only the fresh exfoliated skin beneath. They have also become popular as a treatment for medical conditions such as psoriasis and eczema. Walk-in rates for the Fish Spa – $10 for first half (1/2) hour and subsequent charges are at $0.30 per minute. Slippers and towels are also provided as part of the fee. If you are planning a company/family bonding trip by having fishes nibbling at their feet, you can also book in advance with Qian Hu Fish Farm -> they have this Spa Executive Tour (weekdays only, exclude Public holidays) that can cost as little as $5/head depending on the group size. Check out the Qian Hu Fish Spa brochure (Direct link to a PDF file) for more details. This is the second time I am here for this Fish Spa.. I noticed that the fishes have grown tremendously in size or they had introduced new fish species. Some are as long as my foot and my foot is already quite HUGE! (see above picture). The sign in Mandarin says ” Over Here -> Bigger Fish Bigger Enjoyment” and indeed it is a very interesting and ticklish experience. Don’t worry, not all fishes are as big; there is just one pool with such big fishes, the rest are smaller ones. You can see the difference between the small and big fish in the top right most picture. Besides fish spa, you can see and buy fishes e.g. arowanas, goldfish in Qian Hu. There is also a regular shuttle bus service back to Chua Chu Kang bus interchange. Did you have similar fish spa experiences? Share with us your favorite spots or stories of how you/your friend did not even dare to step into the pool of aggressive fishes, in the comment box below. very interesting site about travel…fish spa seems to be cool…. .-= Webbloggirl´s last blog ..Go Travel and See Disneyland in California =-. I went to the fish spa on a weekend (no car, so only can wait till weekend to take their free bus) and the place was quite packed with families. The kids were paying for Longkang Fishing and the couples were paying for the Fish Spa. For the fish spa, although it is quite cheap compared to Kenko at The Singapore Flyer, there are just not enough fish to share. The pools are so big and yet the fish are so relatively little. Even though Qian Hu have 1 pool that says “bigger fish, bigger sensation”, the fish in this pool is still too little and simply “too arrogant”. They keep changing location (as they swim around in 1 big pack) and a lot of time, my feet are being bored to death without their “kissing”. We are garra rufa breeder from Indonesia. If you need this fish, please contact us. I had no idea you had places such as these fish spas! That’s fantastic. I’ve seen these fishes and how they are used to treat certain skin conditions, but that was in Israel somewhere. I could do with a walk-in fish spa session and I am sure that having all my dried skin being eaten off would be a pleasant experience for me, even though it sounds quite horrible! Hi.. anione knows where i can get the fish in singapore?? Hi Paul, sorry we don’t sell fish. I am concern whether the fish are the genuine doctor fish. Normally, they would not resemble a Tilapia and should be small in size. Very small in size. Nowhere near the size of ur feet.